Johan Utterman, lead portfolio manager, will present at this webinar how to exploit the long-term theme of an ageing population through a conviction-led approach. Notre scénario central prévoit une croissance mondiale supérieure à la tendance, avec une faible probabilité de voir l’une des grandes économies développées entrer en récession. Cependant, l’année prochaine ne sera pas de tout repos. Les marchés devenant nettement plus dynamiques et volatils, nous nous attendons à ce que les relations historiques entre les principales classes d’actifs se retrouvent sous pression. Ainsi, 2019 sera selon nous une année « sans récession mais où tout ne sera pas si simple ». major developed market economies will enter recession. But it will still be far from plain sailing. as markets become significantly more dynamic and volatile. As such, we have dubbed 2019 a “No Recession, Yet Tricky” (NRYT) year. Nous pensons que les arguments en faveur de l’investissement dans les obligations convertibles gérées activement sont nombreux et difficilement réfutables. L'inquiétude est grandissante au sujet de l'inflation, de la valorisation des actifs risqués, des décisions des banques centrales et de l'impact de la montée du protectionnisme. C’est dans ce contexte que les approches de contrôle des risques sont susceptibles d’intéresser davantage les investisseurs. Les obligations convertibles offrent aux investisseurs un profil asymétrique (de risque et de rendement) en associant les caractéristiques d'une obligation d'entreprise à celles d’une option convertissable en actions. Lorsque l'environnement est incertain comme il l'est aujourd'hui, aussi bien sur le plan tactique que stratégique, nous soutenons que les obligations convertibles trouvent toute leur justification. We believe the case for investing in actively-managed convertible bonds is increasingly compelling in the current environment. There are growing concerns regarding inflation, asset valuations, central bank decisions and the impact of rising trade protectionism. Against this backdrop, risk-conscious investment approaches are set to become more attractive to investors. Convertible bonds offer investors an asymmetric risk and return profile as they combine the characteristics of a corporate bond and the option to convert that bond into shares. When times are as uncertain as they are today – both tactically and strategically – we would argue that convertible bonds come into their own. Emerging markets don’t work like they used to, we think. This is a diverse collection of economies which have strengthened and matured over the years. Expert insight and robust analysis are key to finding the investment opportunities in this changing landscape. In this live webinar, Didier Rabattu, Head of Equities, will share his views on the outlook for emerging market economies and explain how investors can find a source of diversified and sustainable investment returns. Robert de Guigné, Head of ESG Solutions, will discuss the most effective means of assessing the sustainability of a company’s business practices with Emma Cusworth, Head of Marketing Strategy. Our methodology requires the inclusion of both long-term and short-term metrics, as well as an analysis of the impact a company’s business practices have on the environment. A proper assessment of a company’s ESG credentials requires careful analysis of large quantities of raw data relating to business practices. We collect the most granular level of non-financial data possible from a range of traditional and alternative sources. Volatility is back. After a prolonged period of smooth sailing, 2018 has served as a sharp reminder that markets can be unpredictable. The big question is: where will volatility strike next? At Lombard Odier Investment Managers, we believe it could be the oil market. We see risk of a spike in oil prices given the overall increase in volatility in the Middle East, and especially in light of OPEC’s agreement to extend the cut in supply to the end of 2018. Excess inventories have been hoovered up and pressure on Iran and Venezuela is adding further risk on the supply side. And, oil being what it is, the ramifications could be felt well beyond the oil market specifically, particularly in emerging market assets. Salman Ahmed, Chief Investment Strategist, will explore our views on the risks currently at play in the oil market and the implications that could have for investment strategies more broadly. Please join us for this brief webinar, which will also include an opportunity to ask Salman any questions you may have on the topic. A sustainability revolution is underway. The global economic model is, in our view, unsustainable. Changing demographics, climate change, scarcity of natural resources, inequality and the digital revolution are some of the structural forces that will transform our economies and the businesses that drive them in the coming years. Consumer behaviour is already shifting as an increasingly informed, and increasingly formidable, social consciousness continues to build. Governments are adding pressure with an acceleration in new legislation, which is increasingly focussed on the role investors can play in financing the transition and holding companies to account. Meanwhile, the changing physical climate is also forcing companies to adapt. This transition creates great opportunity, but it also creates great risk. Sustainability is central to both economic outcomes and risk-adjusted returns. With that in mind, investors need to adapt how they run portfolios. After all, sustainability is not a product issue. It is a multi-jurisdictional, multi-asset-class, multi-sector and multi-strategy issue and thus needs to be looked at holistically. Aurèle Storno, Lead Portfolio manager, and Alain Forclaz, Client Portfolio Manager, will present the All Roads strategy: a liquid, diversified multi-asset strategy with a strong focus on downside protection, which we believe to be best-placed to navigate the new fixed income paradigm. 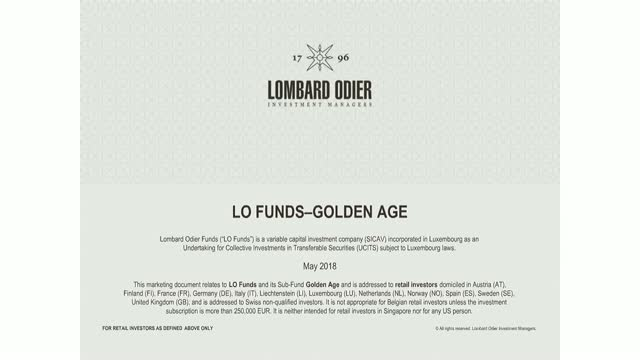 Join Théodore Economou, CIO of Multi Asset and Chairman of LO Pension Fund Investment Committee, and Aurèle Storno, CIO of LO Pension Fund, in this webinar. Charles St Arnaud, Senior Investment Strategist, will give a macro outlook at the beginning of the webinar. • Finding a new liquid core portfolio allocation; a liquid, diversified multi-asset strategy with a strong focus on downside protection is best-placed to fulfill this role, in our view. performance of the Fund for the third quarter of 2017 and discuss the current positioning and 2017 outlook. Didier Rabattu livrera un point macro des marchés émergents. Il expliquera aussi pourquoi, selon lui, les actions émergentes recèlent des opportunités à long terme, à condition de les chercher au bon endroit. performance of the Fund for the second quarter of 2017 and discuss the current positioning and outlook. performance of the Fund for the second quarter of 2017 and discuss the current positioning and 2017 outlook.